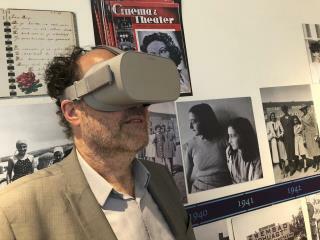 (Newser) – The Amsterdam museum dedicated to Anne Frank's life launched a virtual reality tour of the cramped quarters where the Jewish diarist and her family hid from Nazis during World War II, marking what would have been her 89th birthday Tuesday. The Anne Frank House said the 25-minute tour means people won't have to visit the museum to see the annex where the Franks and four other Jews hid from July 1942 until they were discovered in August 1944 and deported to concentration camps. Anne Frank House Executive Director Ronald Leopold said the tour "offers an immersive experience" of the rooms hidden behind an Amsterdam canal-side house where Anne wrote her diary, the AP reports. The new virtual tour is free and can be downloaded in seven languages from the Oculus Store for Samsung Gear and Oculus Go headsets. People with restricted mobility who visit the Amsterdam museum but cannot tour the small rooms will now be able to experience them in virtual reality. The VR experience will be rolled out to Anne Frank centers in Berlin and New York later this year, the museum said. Only Anne's father, Otto Frank, survived the war. Anne and her sister died in Bergen-Belsen camp. Anne was 15. After the war, Otto Frank had his daughter's diary published, and it went on to become a symbol of hope and resilience that has been translated into dozens of languages. Why are they making this into some sort of amusement? Some people have no respect for the dead. AF only experience was the blitzkrieg. Germany Wehrmacht occupied 3/4 of Europe in one two punch,France and Poland defeated in short period of time.